For what search terms does my website rank? The goal of search engine optimization is for people to find your website when using certain terms or phrases. If you implemented those basic search engine strategies from my last article, how can you check to see what terms and phrases your website is ranking for? How do you know if you need to take the next steps in your SEO strategy? Realize that SEO is not an overnight affair. It’s best to wait a week or two after making changes before checking your results. This article will show you the free tools that from Google and Bing that enable you to see how your website is ranking for certain words and phrases. Not only does using these tools allow you to see how you’re doing for your target terms but you may even find some words and phrases you are ranking for that you had not even considered. In some cases, if you find a less competitive term in your results, you may want to alter your overall strategy to increase your ranking for that term instead. My opinion is that it should be your goal to rank in the first page as often as possible (note, not necessarily first!). Google Search Console is the new name for Google Webmaster Tools. Google Search Console houses a group of tools used by webmasters to help monitor and maintain Google’s ability to index websites. 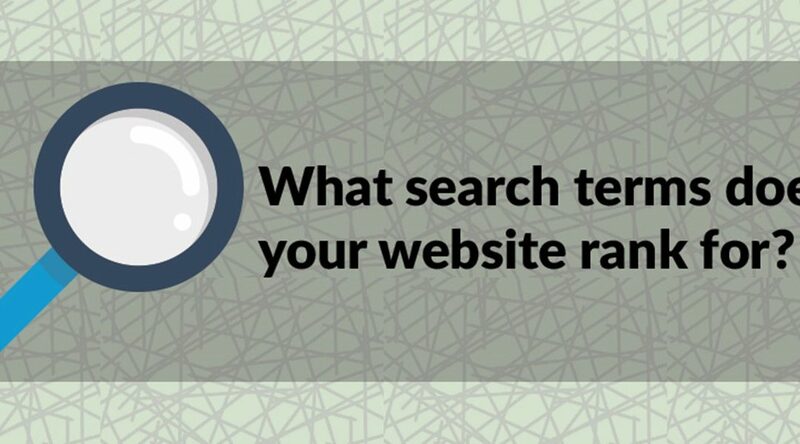 We are going to analyze what terms our website is ranking for by looking at the Search Analytics Report. The Search Analytics Report gives you a list of search terms for which your website appeared in Google search results along with some statistics. I am going to assume that you’ve setup your Google Search Console account and that it’s been around for at least a few weeks. If you haven’t set up yet, complete these instructions to add a site within Google Search Console and then head back in a week or so after Google has a chance to compile the data for you. Now, let’s head over to the report. Within Search Console, make sure you have the right website selected at the very top, expand Search Traffic, and select Search Analytics. First, let’s review a few phrases you’ll see. Clicks. The number of times someone clicked the search term through to your website. Clickthrough rate (CTR). The percentage of clicks to impressions. Position. The average position that your page was in for this search term. This is an average of the top returned page from your website within the results. Queries. The word of phrase for which you ranked. Your report should look similar to this (note, I’ve adjusted the dates to the last 90 days in this example). Now, play with the options to see the search terms or queries for which you ranked on Google. Note, that Google does omit some results (for privacy reasons) so your clicks, impressions, etc may not add up but it still should be a useful representation. Did you find that you are returning for what you hoped? The equivalent of the Search Analytics report within Bing can be found within Bing Webmaster Tools and it’s called the Search Keywords report. One thing to know is that this report shows combined data from both Bing and Yahoo search engines. Again, if you haven’t setup your website, go follow this Getting Started Checklist to setup your website within Bing Webmaster Tools. Like with Google, it will take a few days for data to roll in. If you are already setup, you can access the Search Keywords report by selecting your website, expanding Reports & Data, and then selecting Search Keywords. You should see something like below. The headers are different but basically represent the same options as the Google report. The additional column that the Bing report provides is the “AVG SEARCH CLICK POSITION”. This is the average position of your search result that actually got clicked. It will probably be pretty close to your average search position. Logic would dictate that better position equals more clicks. So, how do the search terms you rank for differ between these search engines? Did you find that the results were pretty similar overall, at least in terms of percentages? Were you happy with the primary terms you ranked for? Any surprises in there? Google has a larger market share of search traffic so you should see higher numbers all around from Google over Bing. If you’re results vary, I’d love to hear your story. If you aren’t seeing your site rank for the terms you’d like, you should circle back to my previous article to make sure you’ve got basic search engine optimizations strategies in place for the terms you think you want. If you have done that already and it’s been a week or two and you still aren’t seeing the results you want, you might be trying to rank for highly competitive terms or targeting them incorrectly. It may be time for professional help. If you’re really into doing it yourself, start here, here and here for reading materials on additional strategies for improving your ranking.